When Harry Met Seinfeld Tour will show a different side of filming in Manhattan, through the lens of some beloved characters. Hundreds of locations north of Times Square have been featured on the big and small screens, but are so often overshadowed by more popular neighborhoods. Beginning north of Times Square and heading through the beautiful and historic Upper West Side and Upper East Side, fans of all ages will experience a New York City they’ve seen on screen but may have missed on family vacations and school field trips. Your adventure begins north of Times Square at McGee’s Pub, the inspiration for MacLaren’s on How I Met Your Mother. Weaving down the crowded avenues you’ll see the original “Soup Man,” from Seinfeld (still possibly the best soup in NYC), and north up 8th Avenue. Surrounding the circle is Trump Tower, the Time Warner Center, and the Maine Memorial, spotted in Tower Heist, The Other Guys and Enchanted. Cruising up Broadway away from the fan fare of Columbus Circle the next landmark you can’t miss will be the famed Lincoln Center. The fountain positioned center among Lincoln Plaza has been featured countless times since the Centers completion in the 1960s. Unmistakable in Moonstruck, Sweet Home Alabama, Glee, and most recently Pitch Perfect, the center has featured hundreds of performances and events. Jerry Seinfeld and his gang called the Upper West Side home, showcasing many neighborhood hotspots over the years. From now closed H&H Bagels to Gray’s Papaya, where you can still grab a NYC hot dog for cheap, these guys knew how to hang. Their favorite spot to hangout - and our second stop - is “Monks,” a.k.a. 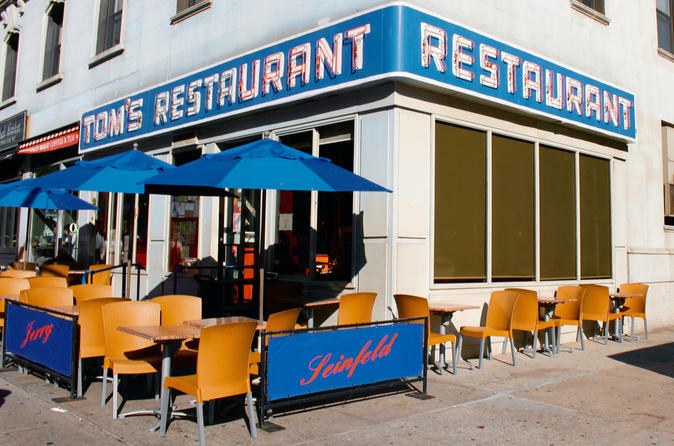 Tom’s Restaurant featured in almost every episode of Seinfeld. Museum Mile is home to ten museums, and featured in far too many movies and TV shows to mention at once. You’ll recognize the City of the Museum of New York as Constance Billard School in Gossip Girl. Down the road is the Guggenheim Museum where Isaac and Mary meet in Woody Allen’s Manhattan. Most famous of all is the The Metropolitan Museum of Art and more importantly, “The Met Steps.” Our third and final stop, thousands of people a day sit on these steps, just like Blair on Gossip Girl and Albert (Kevin James) in Hitch. Inside is the Egyptian Room where Harry and Sally realize their love for one another in When Harry Met Sally. Crossing over 59th Street you’ll be officially leaving Uptown Manhattan and in front of the most filmed building in the world, the Plaza Hotel. Featured in films like The Way We Were, Almost Famous, American Hustle, and Home Alone 2 the building is a never ending classic. Out front is the Pulitzer fountain, inspiration for the fountain the cast of Friends dance in during the opening credits.